To the Bus Drop Off and Pickup Area at Granville Island (see map). Our bus team will welcome you there and take you to your hosts and the Teacher Information Kiosk. Please make sure you schedule your bus to arrive on Granville Island at least 45 minutes before show time. Free parking is available all week in the lot directly under the Burrard Street Bridge. Enter at the foot of Fir St. at West 1st Avenue. Thank you to the Squamish Nation for their generous support. Note: It is a 20-minute kids’ pace walk from the parking lot to Granville Island, so make sure you arrive at least 45 minutes before your show to allow enough time to get to your performance. Paid parking ($15/day), in the covered parking lot off Old Bridge Street on your right, specifically for people with disabilities or with preschool or kindergarten children. Note: We will have a special area (in front of Performance Works, adjacent to the bus drop off area) designated for parents or any special needs drop off and pick up. Catch the #50/15 bus direct to Granville Island. Service every 15 minutes from Waterfront or Olympic Village Skytrain stations. Visit Translink for details and other transit options. As transit takes longer than planned, please allow yourself extra time to get to Granville Island. We recommend arriving on-site a minimum of 45 minutes before show time. to get your tickets, wristbands and Festival Info. Parents, teachers, children, grandparents, aunts, uncles, cousins, acquaintances and friends – everyone is required to purchase a show ticket to attend any of the performances at the festival, with the exception of babes in arms, who are welcome to attend selected performances at no charge. Babes in arms, refers to babies under the age of 12 months, who will not require a seat, and will remain in the arms of their parent or guardian. Festival Site Hours: 9:30 am – 2:30 pm Monday to Friday. A dozen interactive activities, visual arts workshops and lots of surprises! Wristbands required. Our large Activity Village is enclosed in a beautiful park setting. All theatre venues are wheelchair accessible and are subject to change to accommodate capacity. Showing: Jacky’s Village, David Bouchard, Is this a Dagger? LUNCH AREAS – For lunches, there are some lovely picnic sites on the south side of the island adjacent to our Festival site. In case of inclement weather, we have a “rain plan!” We will have a large covered picnic tent, as well as space in several Arts Umbrella classrooms and at several of our performance venues (just prior to, or after your show), all just a short walk from our Activity Village. FOOD SERVICES – Granville Island has plenty of possibilities for lunch and snacks. We will have several food vendors near our Activity Village with inexpensive, kid (and adult) friendly food! WASHROOMS – Your show venues have washrooms facilities and we have portable toilets adjacent to all activities. FIRST AID – Please inform your accompanying teachers & parents that First Aid assistance will be available during festival hours. First Aid is located in a central location close to all activities and venues (please see map). Your festival host will show you where First Aid is located. LOST CHILD PROCEDURES – Lost children will be accompanied to First Aid. Both our team and Granville Island Operations are on radio and ready to assist in reuniting children with their school group or parents. In the case of a missing child, please contact any festival staff member for immediate assistance. Many of our shows have accompanying study guides and interesting websites to help you prepare your class and make the most of their Festival experience (see individual show descriptions on our website). As most shows are real theatre venues, please use this opportunity to teach your students about theatre etiquette. 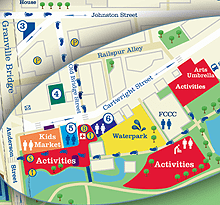 Please note: From May 21- June 2 our office will be at Granville Island Festival House, 1398 Cartwright Street. Wishing you and your class an amazing day at the festival!